I agree that some who are writing him off now are jumping the gun and I'm still very hopeful he'll come good. But I also think that some of the things he's doing are not what you'd expect from a £52m established Brazilian international midfielder - doesn't matter whether you're new to the league or not. That's a big part of the issue, his cost and age. He's our 4th (?) Most expensive ever signing and he's nearly 26, that does mean that there's more expectation than a youngster coming. He's been very poor, I don't think there's anyone who can deny that. The problem I see now, is that he's been so poor, I can't see how we can give him matches in such an important position in order to 'get up to speed'. We have Pogba, Matic, Herrera, Andreas, Fellaini all there, and McTominey if we are desperate. But I can't see how it can be justified in him starting ahead of at least 4, probably 5 midfielders. There are no more easy games, or getting to know the playeys games. OGS has to play his best players to win matches and try and get fourth. Based on what we have seen, Fred is not a first team player at this time, and should not be in a match day 18. There's often a tendancy of the Caf to want to send players out on loan, and it's mostly unjustified (see Rashford), but a loan to a PL (has to be PL) could be a good option to the end of the season, otherwise we have a £52m player, who I honestly can't see playing more than a handful of games for the rest of the season. For a supposed experienced midfielder who has been playing in UCL and WC etc, his touch and passing is pretty loose. I guess Jose managed to sap all the confidence in the club, especially to players that have rarely given enough minutes. Hope the likes of him and Pereira will return to normal at least, so they can play more as the 2nd half of season progresses. Some on here are so knee jerk and quick to form opinions. It is the lads first season in the premier league. Lets wait until next season before writing him off completely. Exactly. Go back to Lindelöf in the defeat at Brighton at the start of this season. Glenn Murray schooled him that day. He couldn't handle the physicality. He was truly hopeless. I don't think anyone would have been bothered if we never saw him again after that. Now look at him. He's come of the back of a string of MOTM displays. He's easily our best defender at the minute. He's even being assertive against big physical strikers like Rondon too which was the big weakness of his. A complete contrast to the the start of the season. This just shows how much of a factor confidence is. You can see Fred is very talented when he gets on the ball. I'm a fan. He has good vision. He picks out some nice passes, quickly advancing the play forward. He just comes across as needing to calm down and stop trying so hard to impress. Which will happen eventually, he just needs time. We just need to show patience in the meantime. I just can't see any justification for him being on the pitch at the moment, and without an injury crisis he won't get on the pitch. It’s weird when he was coming so many were sure it was for a DM but watching him if anything he should probably be Pogbas understudy as he looks like he loves a venture forward, has shown goal scoring instincts, an ability to travel with the ball and an eye for a pass, just a bonus that he has a bit of the Herrera appetite for winning the ball back. I’m not convinced he and Pogba with Matic would be a great idea, right now Herrera seems the glue that holds that together and makes it work. exactly. I made a very similar post above. I think many on this forum are too young to remember Evra + Vidic's first few matches. Evra got subbed at HT after a shocker, Vidic took a few fair months to even start looking impressive. Players from foreign countries always take time to settle. Some better than others. But when is he even going to get to play? He appears to be such an I'll thought out signing by the club. At his best, is he going to be a great midfielder, or just another squad player? Midfield wasn't the issue in the summer. I hate to take a leaf out of Liverpool's book, but they spent big on their biggest problem areas, CB and GK. We spent big on another squad player that we didn't need, and that's one of the reasons his playing time will be so limited, we have so many other players there. I think he's some really good qualities for a box to box midfielder. He obviously has the talent. He can pick a pass and times his ball control is very Brazilian and then at times, it has been Lukakusque. I feel he need more game time. he is not a defensive midfield player by any stretch of the imagination. As another OP has said he should be the under study for Pogab. He is best when he attacks. Who is going to turn out the better signing - Bet Victor or Bet Fred? Our midfield is actually pretty good, and we have numbers there - and they generally stay fit! Our CBs are poor, and cannot stay fit, ergo Lindelof will get lots of opportunities, which I can’t see Fred getting at all. I think Lindelof will be a useful squad player, and I think Fred will be gone within 18 months. I’d love to be wrong, and both turn out to be great first team players. What’s the reason for Fred not being in Dubai? I think his girlfriend is pregnant. Tbh, I think that was the Mirror so literally could be any reason. Suppose that’s valid however don’t think it’s a very good look. Perfect chance to really get some more work in. Yes, it will be difficult for him at the moment, but some players do take time to settle into new surroundings, and with his partner about to give birth, I can understand why he may not be totally focussed. Let Ole work with him, let him know what is required to be a Manchester United player, give him a few runouts before the end of the season, and then we may see what he is really like. What's he supposed to be good at? I wouldn't knock someone for wanting to be there for the birth of their child over showing up for a work thing. He's still showing up for work anyway and if it counts against him he'll be with another high paying job soon anyway. Are people really suggesting he should miss the both of his child? Completely fine for me for him to attend the birth of his child. Football wise he's irrelevant for the team anyway so I shouldn't be mad at him missing the training. Joined the rest of the midfielders in becoming a father. Congrats! Congratulations Fred, all the best to the new addition to your family. The more you see the recordings of the matches, the better you realise that he is not a bad player. He has the attributes to be a very good football player. Think he'll be an important squad player in in the coming months. We have a lot of games coming up, and we'll need to rest our best midfielders at some point. Hope he kicks on and puts in some decent performances. Really like the guy, would be a shame if he flopped. He has vision and the Brasilian touch. I remember the way he toe flipped a pass during one of his recent games. His ball control and passing is not bad. It is that sometimes he is careless in his passing. Still not getting a nod. Guess it's still Mourinho's fault? Well he's not going to get in ahead of Herrera at the moment. Squad rotation. He'll play the next game for sure. 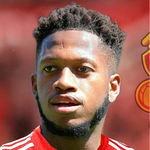 We should gird ourselves against the possibility that Fred will fail to make a notable contribution to the squad this season, but we may a pretty decent midfielder on our hands next season. Patience is required here. He’s a good player. He’ll come good, just needs abit of time and patience. His touch and passing is loose at times, and he always seem to think he has infinite time on the ball. He is talented, but he does not seem like someone that has had any iota of coaching. He is inconsistent at everything and desparately needs to sharpen up. He’s just massively overpriced. He’ll be a decent member of the squad I think and there’s no massive need to panic. It wasn’t long ago people wanted Herrera out but he’s a high-end squad midfielder who would end up at a top club if he ever left United. I think Fred is going to be the same type of player. It’d be better to have got him cheaper though. Still have faith in him. Think he’ll need the full season, but he should be judged fair and square next season if he doesn’t perform. Similarly with Naby Keita at Liverpool. Some players take longer than others, although fans should not reserve judgment forever either. Very excited to see him in action again. Hopefully on Tuesday . You would hope Mr. Carrick might have a word with him and just calm him down a bit. His passing is all over the shop and Carrick might just help. Talked to a friend from Ukraine today about Fred, he said that Fred used to play in a defensive role more like a Holding, but never looked like he is on the same level as Fernandinho. 1. Fred took the full time off after the world cup after not playing a single game. 2. Morinio and OGS both said that Andreas is working really hard in training but you never hear it about Fred. I’d give him a game tonight against Burnley and rest one of Matic or Herrera. We need to see if we can get something out of him. It’ll be madness to go into the Feb busy period with only 2 functional holding midfielders. He's only played 90 minutes more for United than Phil Foden has for City this season.